St. Kieran of Saighir was born in Ireland, possibly on Cape Clear Island. Historians disagree on his date of birth, although most sources place him in the fifth or sixth century. His father’s name was Laighne, and his mother was Liadain. At that time, the Irish were non-Christians. Many legends exist concerning the events of Kieran’s life. One says that when his mother was pregnant with Kieran, she had a dream that a star fell from heaven and came to rest on her. People said this meant the baby she carried would have a special purpose. When Kieran was a child, he was kind and gentle. He loved animals, and they trusted him. Several of the stories about St. Kieran tell of his ability to tame wild animals, and he is often shown with a badger, a doe, and a fox. Kieran wanted to learn more about God, so when he was thirty years old he went to Rome, the center of Christianity. He spent several years there, studying. Kieran was baptized a Christian and later ordained a priest. Legends disagree about whether Kieran was ordained a bishop in Rome or later in Ireland. Many stories say that St. Patrick met with Kieran in Rome and commissioned him to return to Ireland and build a monastery. He is known as one of the Twelve Apostles of Ireland. One legend tells of St. Patrick giving Kieran a bell that rang for the first time when he reached the sight of a holy well in Saighir, and there he built his church. This became renowned as a sacred place, and many of the ancient Kings of Ossory were buried there. Legend tells that Kieran had hoped to live a life of solitude, and upon his return to Ossary he dwelt in a cave where he spent much of his time in prayer. As the story goes, he befriended the animals who come to him when they were sick or hurt. People began to hear of his powers of healing. He ministered to the people and soon had a following. Kieran built a monastery in Ossary, and the town of Saighir grew up around it. Kieran served the people as Bishop of Ossory until his death. 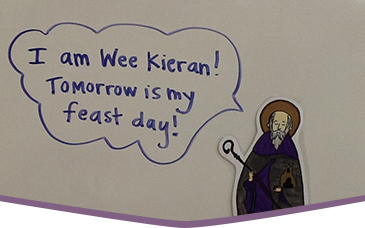 Kieran is the first person born in Ireland to be canonized a saint. The ruins of the original church, the well round the fountain, and other holy sites related to St. Kieran can be seen today in Saighir, Ossory, Ireland. In Ireland, his name is spelled Ciaran, pronounced “Kigh-ran” of “Sigh-gear.” He is also called St. Kieran the Elder, to distinguish from Saint Kieran of Clonmacnoise. The Feast of St. Kieran is celebrated on March 5.